Valhalla Academy is an Academy of MMA aka Mixed Martial Arts Fredericksburg VA , one of the newest, yet fastest growing schools offering fun, yet challenging classes not only for personal defense, but to help you reach all of your health and fitness goals. 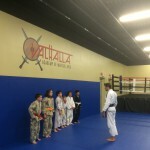 Valhalla is the foremost martial arts school in Fredericksburg / Spotsylvania County, providing students with a fun and safe environment to get exercise and become physically and mentally fit. Valhalla Martial Arts training contains practical self-defense from some of the most effective, respected, and revered martial arts styles and systems in the world including; Brazilian Jiu-Jitsu, Combat Submission Wrestling (Mixed Martial Arts), Muay Thai/Thai Kickboxing, Western Boxing, Savate, and Bruce Lee’s Jeet Kune Do. Valhalla Academy of Martial Arts provides expert instruction that helps students find their own style and path according their own needs and goals. Instruction is tailored to fit the individual student in order to help him or her reach their full potential. We have programs for Adults and Children. Our kids programs are great for developing self confidence, self-discipline, strong character and overall physical fitness including all the benefits that come with a healthy lifestyle. We start children at four years of age. Adults and Teens (13 and up) will find our classes exciting and as being the perfect opportunity to get away from the normal grind of day-to-day life. Whether striking, grappling or weapons training; you’re sure to leave the academy feeling like you’ve reached yet another step towards your personal goals, the reasons for which you’ll be dedicating yourself to every day! Andrew Heatwole from Stafford County, VA founded Valhalla in 2014 to share his experience and knowledge in the following arts; Combat Submission Wrestling (CSW aka Mixed Martial Arts), Brazilian Jiu-Jitsu (BJJ), Filipino Martial Arts (Kali, Arnis, Escrima), and STX (Savate/Thai Boxing Cross Training). After 10 years + teaching experience, he has trained and helped hundreds of students, both Adults and Children, learn about the arts and how to become proficient. October 1, 2015 - Updates - Comments Off on What is Jeet Kune Do? Brazilian Jiu-Jitsu Teaches Real Discipline and Kids Need It! April 29, 2015 - Updates - Comments Off on Brazilian Jiu-Jitsu Teaches Real Discipline and Kids Need It! Is Brazilian Jiu-Jitsu still effective in MMA? February 9, 2015 - Updates - Comments Off on Is Brazilian Jiu-Jitsu still effective in MMA?